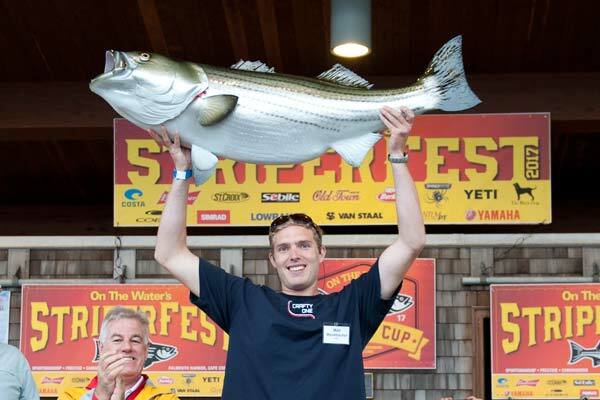 Matt Weckbacher holds up the replica mount of his 69-pound striped bass that took first place in Striperfest, a season-long striped bass tournament sponsored by On-the-Water magazine. The Rhode Island Department of Environmental Management (DEM) is stocking ponds across Rhode Island with 10,000 trout in advance of Columbus Day weekend. A select number of waterways will be stocked given current drought conditions and as conditions improve, additional stocking will take place. As part of a new initiative aimed at making larger, trophy-sized, hatchery-raised brown trout available to anglers, 400 brood stock brown trout with an average weight of 4 to 6 pounds will be stocked at Carbuncle Pond in Coventry beginning this fall. The following waters will be stocked: Carbuncle Pond, Coventry; Olney Pond, Lincoln; Silver Spring Pond, North Kingstown; Barber Pond, South Kingstown; Round Top Ponds, Burrillville; Meadowbrook Pond, Cronan Landing, Lower Shannock Fishing Area, and Beaver River (Rt. 138), Richmond; Ponagansett Fishing Area, Foster; Wallum Lake, Burrillville; Wood River, Dow Field, Mechanic Street, Barberville, Wyoming Pond, and the Pawcatuck River, Hopkinton; and Potter Hill Landing, Westerly. A current fishing license and a Trout Conservation Stamp are required to keep or possess a trout or to fish in a catch-and-release or fly-fishing only area. A trout stamp is not required for persons possessing trout taken from a lake or pond that shares a border with Rhode Island. For stocking information and freshwater fishing regulations visit www.dem.ri.gov. The Atlantic States Marine Fisheries Commission (ASMFC) hosted an Atlantic menhaden public hearing at the URI Bay Campus Wednesday night. About fourty anglers, environmentalist and DEM fish mangers attended. One of the key issues discussed was establishing Ecological Reference Points (ERP) for the species in Amendment 3 to modify the Atlantic menhaden Fishery Management Plan. Overwhelming with a 23 to 2 vote those in attendance supported an option that suggested a 75% target for biomass of Atlantic Menhaden to be left in the water as forage fish and ecological purposes. Atlantic menhaden serve as a food source for striped bass, bluefish, whales, osprey and other species. They also serve an ecological purpose. Atlantic menhaden are filter feeders helping to reduce nutrient levels in the Bay and Ocean. The second key issue discussed was the reallocation of quota to coastal states. Virginia’s quota has historically hovered around 85% (with one fish processor Omega Protein landing most of that), New Jersey has been at about 11% and the remaining quota split among all other east coast states (Rhode Island’s quota is 0.02%). Once again overwhelming (23 to 1) those in attendance supported allocating a minimum of 3% to Rhode Island and other states that have small quotas at this time. The rational put forward was that historically states other than Virginia and New Jersey also had active fisheries but they closed due to a lock of fish. Now that the species is doing well and more fish are in northern waters quota should be reallocated to these states. Amendment 3 will now go before the ASMFC Atlantic menhaden advisory panel for discussion and then the Atlantic menhaden board for decision and a vote in November. For information about Atlantic menhaden Amendment 3 visit www.asmfc.org . DEM in partnership with the City of Central Falls and Progreso Latino, will host a family fishing event at Lincoln Woods State Park on Saturday, October 7, 11:00 a.m. to 3:00 p.m. The event is part of DEM’s ongoing efforts to promote outdoor recreation and environmental education in communities across the state. As part of the festivities, instructors from DEM’s Aquatic Resource Education (ARE) program will teach participants how to catch and clean trout. DEM teamed up with the City and Progreso Latino this summer to host a saltwater fishing excursion for residents of the Central Falls community; as part of this earlier event, some 50 people enjoyed a day on Narragansett Bay aboard the Francis Fleet Charter from Galilee, learning about the diversity and abundance of marine life in the Bay.